The latest vehicles come with a lot of new safety features, such as driver assistance sensors. 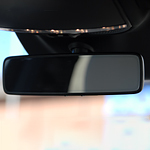 These sensors can go everywhere, such as on the outside of the vehicle or even in the rearview mirror. In this case, auto-dimming has been able to save the lives of many drivers who experience the "Troxler Effect." Before auto-dimming mirrors were invented, many people had to adjust their mirrors for driving at night to avoid glare. Did you know that those who experience the Troxler Effect had temporary blindness lasting up to 2 seconds or more? Auto-dimming or electrochromic mirrors are able to take away those issues using sensors and cameras. Once the sensor detects a high glare, it automatically changes the mirror to deflect that glare. Auto-dimming has become a great way to prevent issues with night time blindness due to headlight glare. Want to test drive a vehicle with this feature? Stop by Lion Country Kia.